Some friends invited us over for brunch this morning and they gave us some serrano and habanero peppers from their garden to take home. I'm a little obsessed with hot sauces. It's the most plentiful condiment in my refrigerator. 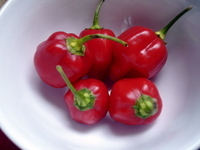 Once I saw those peppers, I knew they were destined to become hot sauce. 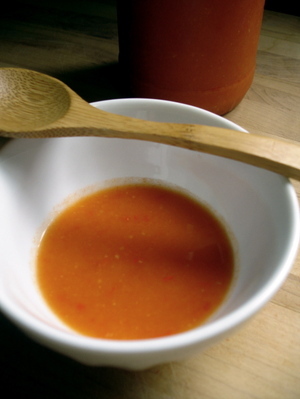 If you have peppers, garlic, and vinegar on hand you can make your own hot sauce. It's pretty hard to make a bad one. Try it and you'll find you can whip something up that tastes far superior to anything store-bought. Wear gloves when de-seeding the peppers. For a thicker sauce, reduce amount of water and vinegar by half. Cook peppers, carrots, and garlic in a little olive oil over low heat until softened, about 10 minutes. Turn heat up to high and add water, vinegar, and lime juice. Bring to a boil, reduce heat to medium-high, and simmer for five minutes. Remove from heat, cover, and let cool. Taste for salt. Put mixture into a blender and process until very well blended. The mixture will be slightly chunky, but liquidy. For a more refined sauce, strain. If you're not fancy (and I'm not) pour unstrained hot sauce into a clean bottle (empty vinegar bottles work great for this) and store in fridge. Makes about 2 cups. Use as you would Tabasco sauce. It's yummy on eggs, grilled meats, with Mexican food, or in Bloody Caesars. I love hot sauce - any kind and all kinds but I have never attempted to make my own. Your recipe sounds really good. I think I will try it. Thanks for the recipe! this kind of topic lends itself to a good review, because when it comes to hot things can be interpreted in many ways, sometimes comic, sometimes seriously, in order to thank them for sharing the information!